A Kentucky project is laying the groundwork for more widespread electronic reporting of cancer cases to state registries. In October 2012, the University of Kentucky launched the country’s first working model for EHR reporting of cancer cases to a state’s cancer registry. The project marks a milestone in the operation of cancer registries, institutions that have been collecting and analyzing cancer-related data for nearly 100 years. Cancer registries, which exist in every state, typically fall into three categories: those that function within a health care facility, locale-specific registries that gather information across a specified geographic area, and purpose-specific registries that collect data on particular cancer types. Among the information amassed by cancer registries are patient demographics and medical histories, diagnoses, types and stages of cancer, and treatment. Following treatment, they track patients to gather data on cancer recurrence, survival, and death rates. Once all this information is gathered, it is analyzed, consolidated, and forwarded to state registries. Then states send the findings to the National Program of Cancer Registries at the Centers for Disease Control and Prevention (CDC). Additionally, state registries sponsored by the National Cancer Institute (NCI) send their data to the Surveillance, Epidemiology, and End Results Program (SEER). The entire process is invaluable. For example, the wealth of data is critical to determining the location of cancer clusters as well as for the development and tracking of the most effective therapies, treatments, and cancer-control interventions. Public health officials also use the data to make decisions on research funding and educational and screening programs. The new EHR model at the University of Kentucky offers oncologists and other providers in the state, which has the nation’s highest incidence of cancer, the opportunity to provide clinical data for the Kentucky Cancer Registry in real time, enabling epidemiologists to observe trends in cancer statistics more quickly. “This is an important step toward making cancer-related comparative effectiveness research studies possible in Kentucky,” says Tom Tucker, MPH, PhD, director of the Kentucky Cancer Registry. Funded as part of the ARRA’s comparative effectiveness research activities at the CDC, the Kentucky EHR project is an important step toward meeting the needs of cancer-control efforts by ensuring that the most current cancer diagnosis and treatment information is available. The project’s principal investigators, Tucker and Eric Durbin, DrPH, MS, the registry’s director of cancer informatics, were awarded a nearly $1 million subcontract over three years to develop the methods and standards for EHRs to report information directly to Kentucky’s cancer registry. 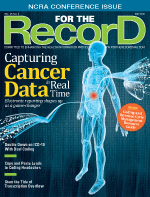 In the past, cancer registries collected vast amounts of data from paper. From these documents, staff would follow up to gather missing information and create a consolidated report. Overall, the process could take more than one year to complete. A common complaint among cancer registry staff revolves around their ability to handle an overwhelming workload with limited manpower. However, when using an EHR to report data, abstraction can be done more quickly, easing some of the burden on registry staff. For real-time data delivery to cancer registries to be successful, organizations must employ a certified EHR that can export the standard electronic message structure, Durbin says. Currently, because of variations in EHR software, not all vendors support the process. While gathering the necessary information can be challenging, Ward says there is hope that as EHRs become better equipped to exchange information with disparate systems, the process will become more efficient. Some patient privacy advocates are concerned that using EHRs to report cancer data will raise the prospect of patient information being exposed to unauthorized personnel. However, registry experts believe proper precautions and safeguards have been implemented. Throughout the process, patient information is kept confidential per HIPAA requirements, with no identifiers used in analysis or publication. As long as registries are reporting required data elements, there is no HIPAA violation, according to Cleveland, who adds that states receive all data, including patient information, cancer details, extent of the disease, treatments, and outcomes, and consolidate them into a succinct summary. Other states have noticed the Kentucky program’s success and followed in its steps. For example, Missouri has undertaken an expansive project to identify nonhospital sources, such as physician offices, which can use EHRs to report cancer data. The idea is that cancer cases diagnosed and treated in ambulatory settings are underreported and require greater cooperation from smaller facilities to gather data effectively. It’s also important to note that stage 2 of meaningful use calls for physician EHR reporting to cancer registries for comparative effectiveness research. In that regard, much work still needs to be done, Durbin says. “We’re working to overcome all the challenges we’ve identified and while we’re still not yet at the point of receiving all information in real time, we’re working closely with providers and EHR vendors to improve the process,” he notes. The American Society of Clinical Oncology (ASCO) has announced that it has completed a prototype of CancerLinQ, an HIT initiative to achieve higher-quality, higher-value cancer care with better outcomes for patients. The prototype demonstrates the feasibility of an HIT-based learning health system, which the Institute of Medicine (IOM) has defined as critical to the future of the nation’s health care system. The ASCO is developing a knowledge-generating computer network that will collect and analyze cancer care data from millions of patient visits with expert guidelines and other evidence to generate real-time, personalized guidance and quality feedback for physicians. The ASCO built the CancerLinQ prototype to demonstrate the feasibility of such a system and provide lessons about the technological and logistical challenges involved in full-scale implementation. The prototype includes deidentified data from 100,000 patients with breast cancer who were treated at leading cancer care institutions in the United States. It reflects more than one year of formative work, including consultation with the oncology and IT communities; efforts to improve oncology data standards; and extensive technology and legal analysis. • Real-time data collection: The prototype can successfully accept any cancer care data in any standard directly from EHRs and other sources, overcoming the longstanding hurdle posed by inconsistent health data standards. Data can range from genomic profiles to lab tests and even physicians’ notes. • Clinical decision support: The prototype can generate individualized guidance on the care of any given patient with breast cancer based on automated, machine-readable versions of the ASCO’s expert breast cancer guidelines. The full CancerLinQ system, when implemented, also will provide guidance based on the collective experiences of other similar patients. • Data mining and visualization: The prototype allows exploration of an extensive database of information on the care of patients with breast cancer, including patient characteristics, treatments, and outcomes, to identify real-world trends and associations and new research hypotheses. • Quality feedback: The prototype can provide immediate feedback on physicians’ performance against 10 quality measures from the ASCO’s Quality Oncology Practice Initiative. The prototype ultimately will include data on more than 133,000 cases from oncology practices across the country, far exceeding initial expectations and lending further strength to the lessons that can be drawn from the prototype.